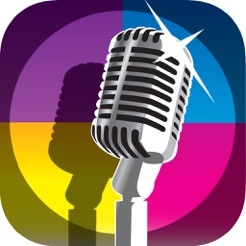 This harmony singing app comes with three songs, with many more available through in-app purchase. 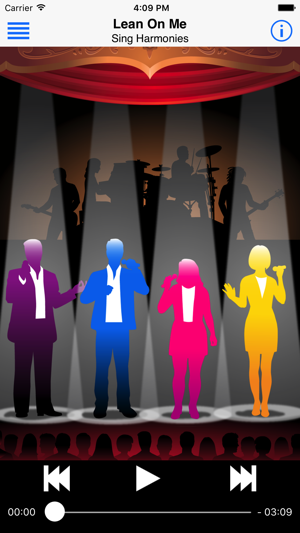 Learn how to sing harmony and polish your harmonizing skills by playing or muting any of the singers as you sing along with 4-part vocal arrangements of "Lean On Me", "Teach Your Children", and "Proud Mary". Harmonizing is easy with this multi-track learning app. The 38 additional songs available through in-app purchase include "Hallelujah", "Rolling in the Deep", "Amazing Grace", "Take it Easy", “Bridge Over Troubled Water”, “California Dreaming”, and many more. Detailed song info is at www.SingHarmonies.com. • Tap ‘play’ to hear a 4-part harmony version of the song. Tap any singer to rotate through the three volume settings: full, soft, and silent. Tap the band in the background to turn the music track on or off. • To hear and learn any of the parts, mute the three other singers and sing along with the solo voice, with or without the music track. Then tap any or all of the other singers and sing your part along with them. • The voices can be added or muted as the song progresses, and can be played at half volume as a guide while the other voices are set at full volume. • Move to different parts of the song with the slider at the bottom of the screen. 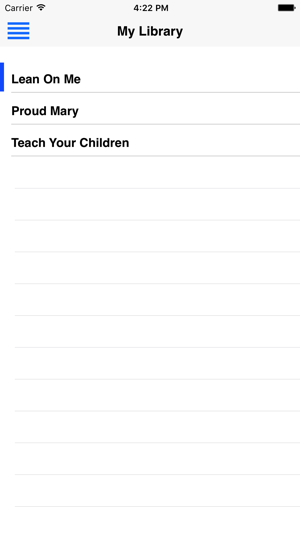 Tap the menu icon to navigate to the Library and select another song. Tap the information icon for more information. • Tap Song Store in the menu to see and purchase more songs. 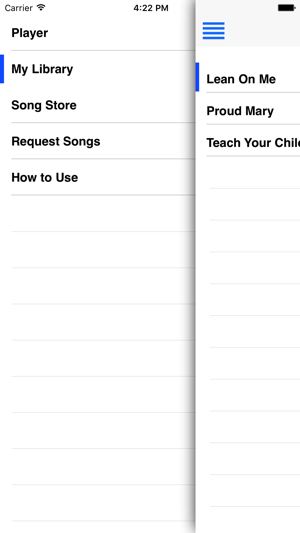 • Tap Library in the menu to see all the songs you can currently play. • No music reading, previous singing experience, or training necessary. • Works with iPhone, iPod Touch, and iPad. • All ages can use. 10 new in-app purchase songs have been added, for a total of 38 in-app purchase songs. The app comes with 3 songs. I use this wonderful app to learn harmony parts to teach my class. I cannot read music so this is super helpful, and easy to use. Nice selection of kid friendly songs. So grateful this exists! They just added more songs, including my favorite Helplessly Hoping! This app works nice if this song you want to learn is in the small list that’s available. I thought I could actually use my own music library but that’s not the case. Sorry you were disappointed. We clearly state in the app details that the app comes with three songs and that dozens more are available via in-app purchase. There's no indication there that you can use the app on your own library: that would be a very complex and expensive app, if anyone could create that. If you would like a refund please contact us, there's an email link in the app.